Burger King have extolled the virtues of ‘having it your way’ for years. The rise and rise of Moonpig.com – just sold to Photobox for £120m. M&Ms now offer an online service where you can print personalised messages on the sweets and choose colour combinations. Consumers expectations for a more personal experience are also raised by the increasing ability of brands to personalise online content. Anything from setting alerts on Rightmove, to purchase suggestions from Amazon. Taking personalisation to the extreme is customisation – JKR recently wrote an article asking whether FMCG can do this convincingly. * They highlighted the growing trend for customisation in FMCG with some interesting examples. Plus they identified online models as a useful medium for a foray into this trend for brands who have tight margins and limited retail facings. But, as they say, it’s ‘a bit of a palaver’ to set up. And the appetite (skuse the pun) for personalised packaging for my cornflakes remains unproven! 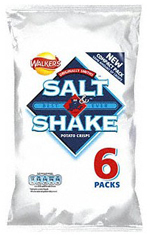 Salt ‘n’ Shake crisps – they’ve been around for years. From one six pack each member of the family can salt their crisps to taste. Not only that but the consumer engages more with the product. Dad feels: I know how much salt I am consuming here. Kids just find a little blue parcel in their crisps fun. Brand aficionados enjoy the ritual. In the dairy category any dip and dipper combination offers a personally engaging experience with the brand – it’s having to interact with the product that makes for a more personal experience. Kraft takes this to another level with Dairylea Lunchables allowing consumers to happily combine cheese, ham and crackers as it suits them. Even offering alternatives within a range, where product attributes can be quite polarising, can give the consumer a more personal experience of a brand – for example: smooth or crunchy peanut butter; juice with bits or not. Both Scratch and Lyons Seafood Co combinations have shaken the chilled ready meals category by asking the consumer to make it themselves – to call it a ready meal sounds like a misnomer. But actually these brands have taken out the hassle (recipe hunting, shopping, finding tricksy ingredients, food prep) and left the consumer with the creative, fun part (combining, frying) and means they can adapt the combination of sauce, veg/carb and protein to their personal preference. Any heavily fragranced categories – for example deodorants, polish even air fresheners could operate in a way that you could dial up or down the strength of fragrance to your liking? 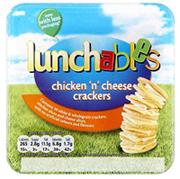 Dairy – where are the Lunchables options for adults? – how about a little selection of grapes, cheese, crackers, pate and chutney as lunch or snacking option? Desserts – What about ‘scratch’ style chilled desserts – imagine all the requisite for a delish Eton Mess, all ready to throw together yourself – personally I would go easy on the cream, but my best friend would not! What should you be asking yourselves and your consumers if you are thinking of embracing the personalisation trend within your organisation’s NPD? A flavouring for water. You deliver the flavour to your water using a little pipette type device. It comes in a very cool, small, highly portable packaging. MiO is Italian for my or mine. Is there a product out there that currently gives a personalised outcome that we can reposition as such e.g. cordial? How do we reposition an everyday product to be about personalisation? Is it about fun, ritual or control? Assuming for example it’s about control. How do we communicate it so people get it? E.g. is the word “Control’ good? Or too strong? Is “My” or “Mine” better? How can the structural packaging and size help deliver as personal feel? For example could it be smaller, handbag sized, fit in the hand, or be discreet, e.g. a type of dispenser? One mascara that allows you to create two different looks – a lighter (day) look and a dramatic (night) look – it’s achieved by being supplied with two different wands. Can we somehow combine technologies we already use to create something that gives a personalised outcome? Should the product communication be explicitly personal like MiO (above) or more subtle? How to position the consumer benefit? For example: day/night? Natural dramatic? 2in1? Your Way? How much is the consumer prepared to pay for the benefit e.g. to have the option of a more personalised look at all times? Versus two different mascaras? Is there a genuine consumer need here – if so, what is it? E.g. your ‘evening’ mascara doesn’t go clumpy when you’re using it less regularly? Is there anything about our product that can be polarising? For example some sweet flavours are more appealing to individuals than others – how can we overcome that, making it more likely to be enjoyable to the individual? Can we draw inspiration by how consumers actually use our existing products? For example, do they shove more than one in their mouth or is it just one at a time? How do we communicate the benefit of what we have changed or developed? For example should the name be about making connections between shapes i.e. Guzzle Puzzle? Or is it really about the interaction and personal reward of creating new flavours? 1. JKR – Can FMCG implement convincing customisation?